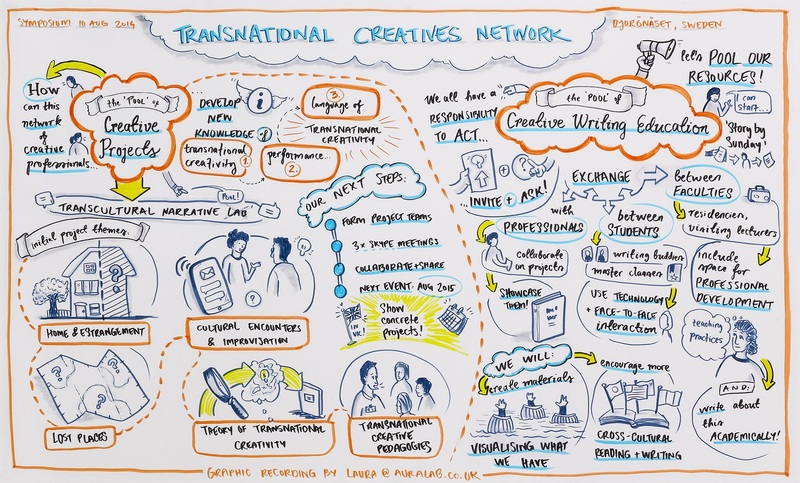 Transnational Creatives is an international network of creative individuals, researchers, and organisations, bringing new perspectives to transnationalism. Transnationalism itself is a field that seeks to understand the reformation of cultural and social relationships within and across borders. Theories emerging from this field typically redefine and critique questions of identity, community and economy in the context of 21st century life and culture. Transnational Creatives initiative came out of a need for developing practice-led field of inquiry that involves academic study and innovative writing practices, which specifically deal with issues pertaining to transnationality. It was initiated in 2014 by Stockholm University through a partnership with Bath Spa University, and the University of Adelaide. It is a part of GALA (global academy of liberal arts), which gathers universities from all inhabited continents to create an overarching framework for variegated types of research and creative practice. The majority of our members are creative professionals and academics currently active in the production of new works across borders and for international markets. Many of us are also involved in the design and implementation of cross-cultural training initiatives for early and mid career creative professionals. We want to use our perspectives and experiences to inform the development of critical and contextual research into transnationalism. Our network aims to explore and develop knowledge about the transformation, exchange and translation of creative practices across both geographical and artistic borders. We rely heavily on the idea of embodied analysis of themes such as border-crossing, intercultural exchanges, and cultural opacity. Creative: Professionals involved in the production or dissemination of creative works. We are particularly interested in working with people from the fields of literature, digital media, film and/or the performing arts whose work should have an international audience and/or who should be open to working with other members interested in comparative transnational context. Critical: Researchers and academics interested in working with creative practitioners to explore the social conditions involved in the production of creative work. 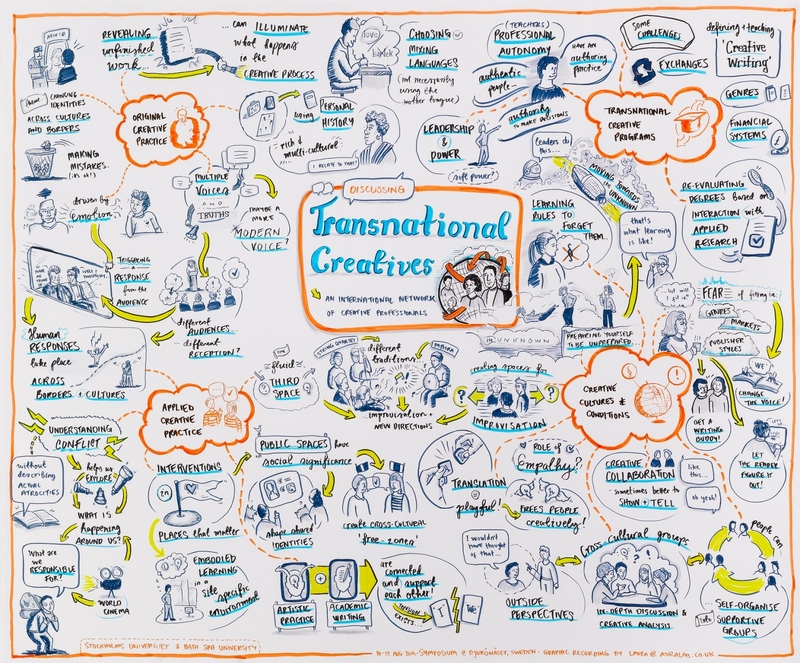 Transnational Creatives initiative began with a symposium in Stockholm on 10–12 August 2014, hosted by the English Department, Stockholm University. This meeting included key members and stakeholders. We were comprised of people who are holding double positions of being both researchers and creative professionals in theatre, film, writing, music, and visual art, working at universities in Stockholm, Bath Spa, Adelaide, Concordia, Hong Kong, New York, Cardiff, Portsmouth, and Redlands. As a way of mapping out the work done at the symposium, we engaged an artist who created the image below as well as the one on top of this page. Following the initial symposium, the main actors within the Transnational Creatives initiative, Adnan Mahmutovic and Bambo Soyinka, worked on a smaller project whose goal was to look over the ways in which the initiative has been taking shape, rework the mission statement, reorganize the field, establish a common module for our respective universities. The making of the module involved everything from the structure and teaching materials to teaching strategies and grading criteria. The workshop participants were Adnan Mahmutovic, SU (literature and creative writing), Bambo Soyinka, Bath Spa (theatre and pedagogy), Ania Spyra, Butler (literature and creative writing), Rebecca McGuire Snieckus, Bath Spa (psychology). Among other things, the workshop developed a creative writing module, Transnational Creativity (15 ECTS credits), which will be offered at several of our partner universities, within existing or future MA programs. A number of lectures within the module will be filmed and shared. We will also share lecturers and teaching materials. Furthermore, the goal is to implement several examination moments that would demand collaboration between students at different universities. This will give them a sense of the width of the network, the international aspects of teaching and research on transnationalism. It will also save the universities some money while streamlining and expanding the programs. Bath Spa University will host a literary festival, to take place in late August 2016, and initiate a journal directly tied to the project of Transnational Creatives.